These bumper stickers for birders all have one theme: car as bird blind. 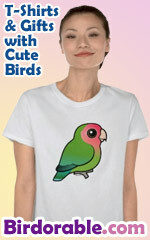 If you bird from the car, these were made just for you! "Mobile Bird Blind" and "Frequent Stops" will let other drivers know you're on the lookout for birds. To order by phone, call toll-free at 1-877-809-1659 from Monday - Saturday 9:00am - 9:00pm EST. You'll need to note the Product Number 030-421122674 to make your order.